Regarding his three stylistically wide-ranging compositions on Change in the Air, Poor offered: "I liked the idea of trying to writing something that could pose as an old standard found in an archive somewhere, and that's how I came up with ‘All That's Left of Me Is You.' The title is a potential lyric for the final melodic phrase of the song. While the song does not in fact have lyrics I wanted us to play it as if we were playing an instrumental version of a standard song like ‘Embraceable You' or ‘If You Could See Me Now.' For ‘Lately' I just had the sound of Cuong and Bill playing the melody and chords vividly in my ears, and I wrote it in one sitting not long before our recording session. ‘Alive' was written back in 2012 for a gig I had in New York with Mark Turner and Pete Rende. I have enjoyed playing that tune with a number of different bands but until now it hasn't been recorded. We needed a few tunes with intensity and tempo to balance the set and ‘Alive' felt like an obvious choice." Poor's sublime brushwork is beautifully showcased on "All That's Left of Me Is You," "Lately" and particularly on the rubato closer "Far From Here," which bears the stamp of the late drumming great and longtime Frisell collaborator Paul Motian. "Paul Motian is a hero of mine," said Poor. "Seeing him at the Village Vanguard with Frisell or with his own bands is something I'll never forget. His playing was riveting, provocative and pure music. Regarding brushwork, he's definitely one of my favorite drummers, along with Andrew Cyrille, Elvin Jones and Philly Joe Jones (his brush playing on ‘Young and Foolish' from Everybody Digs Bill Evans comes to mind). All of those great players are able to extract infinitely nuanced sound and a powerful specificity of mood and feel. Brushes are exciting for me because they allow you to create sustain and offer such a wide range of attack, from staccato to a legato bloom of sound that has no attack at all." Frisell, who moved from New York to Seattle in 1988 and remained there for 30 years before returning to the Big Apple, says the chemistry for this particular quartet began in the Emerald City. "I was lucky to have first met Luke Bergman and over the years we have been playing more and more in all kinds of different situations together. It's been awesome connecting with him. Then as soon as Ted moved to Seattle we started playing a lot together too, just getting together at his house and playing tunes. It was the same with Cuong. As soon as he came to Seattle we started playing together. So it was great to have someone to be able to get together with and practice together and just play music together. That happened with all those guys separately and then eventually the four of us got together as a quartet. Cuong has been such an incredible inspiration-energizer for music in Seattle. Luke and Ted too. They all make things happen." Vu also commented on his uncanny chemistry with Frisell, which is especially apparent in their intimate interactions on Frisell's chamber-like "Look, Listen" and the sparse closer, "Far From Here": "It's pretty much a necessity for me to be surrounded by deeply empathetic listeners whose main priority is to serve the music being created in each instance. And it takes a long time to find the right people who'll create the right mixture together. I really do think that all three of us (Luke, Ted, and I) have a natural strength in ‘empathic listening' - making the others sound better while stating your own opinion with an openness to all possibilities in the immediate moments. And I do really think that we're pretty decent at that approach. But add Bill to the mix...that's his genius! He makes everybody that he's ever played with sound better and always puts them in a different light. It helps that I'm in that same zone of thinking, but it's really about Bill making it happen." 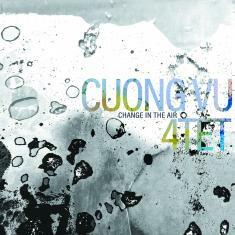 Regarding the source of the album's title, Vu pointed to the state of world affairs today as a kind of dark undercurrent to Change in the Air. "I've never felt so much anxiety about the future on so many levels - environmentally, politically and especially with the ‘leadership' in our country - than I do now," he said. "In terms of what's going on and how we've gotten to this place, it feels overwhelmingly ominous, dangerous and as if it's only the beginning of what will come. I'm scared but, hopefully, just paranoid." CD, VINYL AND MULTIPLE DIGITAL FORMATS AVAILABLE IN STORES AND ONLINE ON SEPTEMBER 28, 2018 AND THROUGH WWW.RARENOISERECORDS.COM.